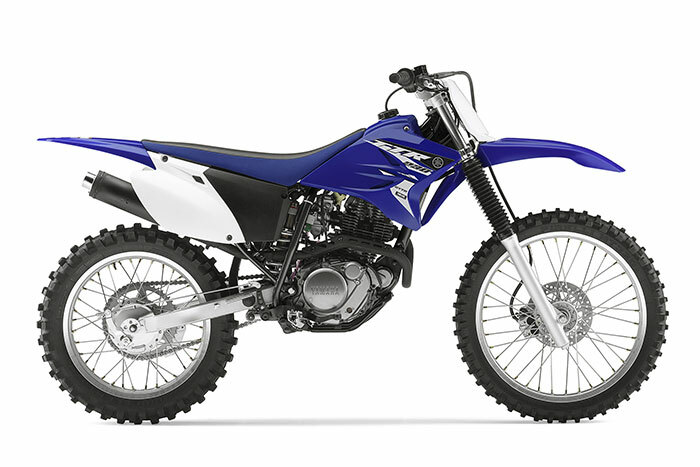 •A low seat height on top of a long-travel suspension and 11.6 inches of ground clearance make this a serious trailbike that’s also accessible to wide range of riders. •Steel, diamond-type-design frame means great handling and strength. • Peppy, air-cooled, 223cc, SOHC, 2-valve, 4-stroke powerplant produces predictable power aimed at easing both beginner and intermediate riders into the fun and excitement of off-road riding. • Convenient, dependable electric starter ensures hassle-free, push-button starting. • CD ignition system is ultra-reliable and never needs maintenance. • Automatic cam chain tensioner reduces maintenance and mechanical noise. • Teikei Y26P carburetor provides crisp throttle response while also providing excellent fuel economy. The carb features “electroless” nickel plating on the valve seat and a stainless steel needle valve screw to off set the effects of E10 fuel (10% ethanol fuel). • WR-style washable foam air filter provides improved engine performance, excellent filtering function and easy serviceability. Since the foam filter is washable, it reduces tune-up costs too. • Smooth shifting, manual, 6-speed, close ratio transmission features optimized gear ratios for maximum off road fun and versatility. 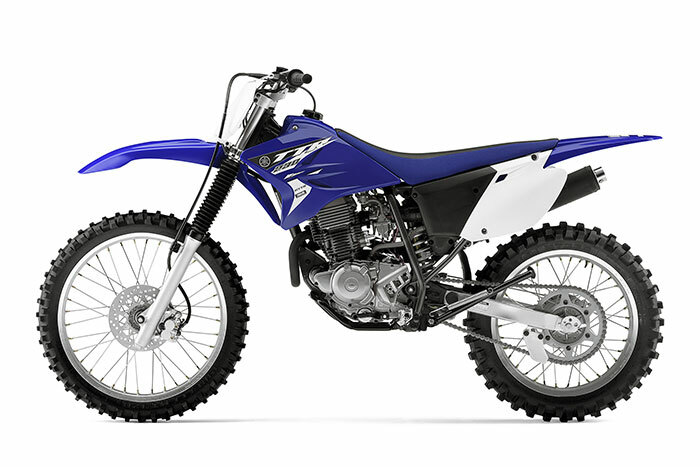 • Lightweight, upswept exhaust system features a screen-type spark arrestor like those found on the WR series. This style of spark arrestor can be cleaned, thereby reducing tune-up costs. There are heat shields to protect the rider. • Diamond-type steel frame features a compact, 1385mm (54.5″) wheelbase to ensure superb maneuverability and responsive handling. • 36mm leading axle front fork offers 240mm (9.5″) of wheel travel providing plush, confidence-inspiring control over rough terrain. • Monocross link single shock rear suspension offers 220mm (8.7″) of wheel travel and delivers smooth, progressive suspension performance. • Rear shock adjusts for spring preload so rider can tailor suspension to rider weight and terrain. • Ground clearance is 295mm or 11.6 inches for enhanced terrainability. • Front 220mm disc with twin piston caliper ensures fast, fade-free stopping power. • 21″ front and 18″ rear aluminum rims reduce weight for great handling and suspension performance. Knobby tires provide motocross-spec traction. 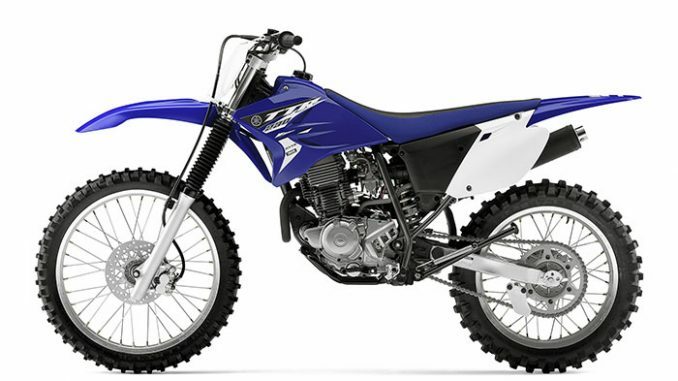 • Aggressive styling highlights Yamaha’s championship winning YZ racing heritage. The rugged plastic components resist damage in the event of a tip over. The slim design bodywork allows excellent rider maneuverability. • 8-litre plastic fuel tank resists damage in the event of a tip over and features an off/on/reserve fuel petcock for peace of mind. • “Bar-type” engine protector offers protection to the engine. 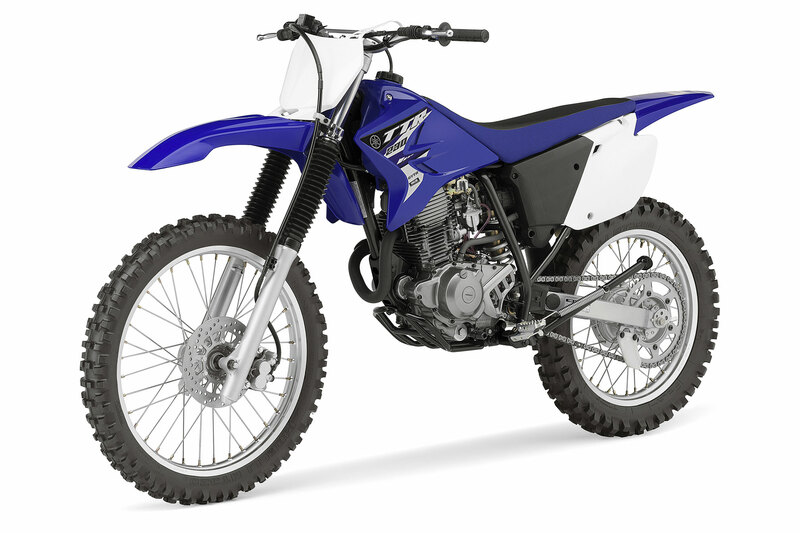 • Long, flat, YZ-style two-tone seat provides great rider comfortable and allows easy rider movements. • Team Yamaha-inspired colour and graphics. • Brake and clutch lever boots / covers help reduce dirt and mud build-up. • Wide serrated folding footpegs provide excellent grip even in wet or muddy conditions. • Lightweight push button main ignition switch is handlebar mounted. Red warning light is provided to indicate if the power is active. • Lightweight, sealed (spill proof) low maintenance battery.